Visited several Spanish restaurants in the past, been to Spain twice and somehow I have not managed to fall in love with any of their dishes. I really wanted to, I kept trying new dishes hoping to eat something that would blow me away but that never happened. So I came to two conclusions: Hungarian cuisine is so fantastically diverse and varied in technique it’s difficult to amaze me with special ways of treating ingredients and turning it into a blast. And there is nothing wrong with that really, I just had too high expectations. 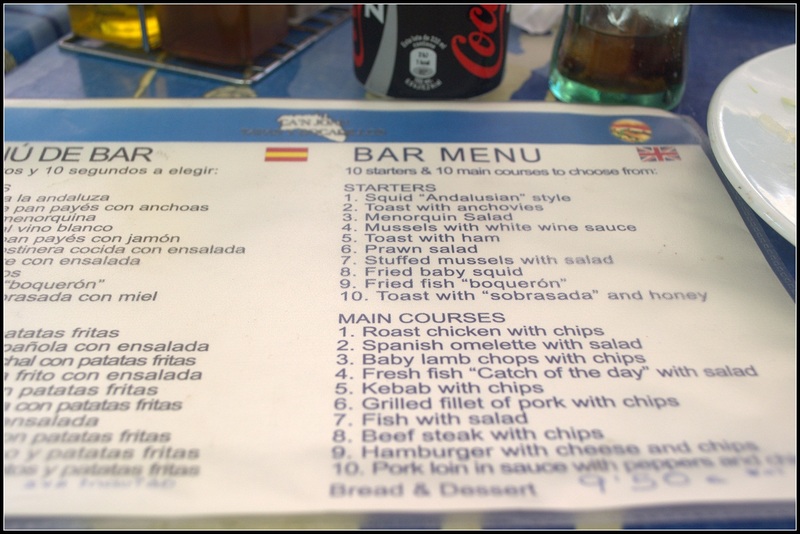 Because if I really think about it the Spanish cuisine can get away with it as a result of such an array of fresh ingredients. 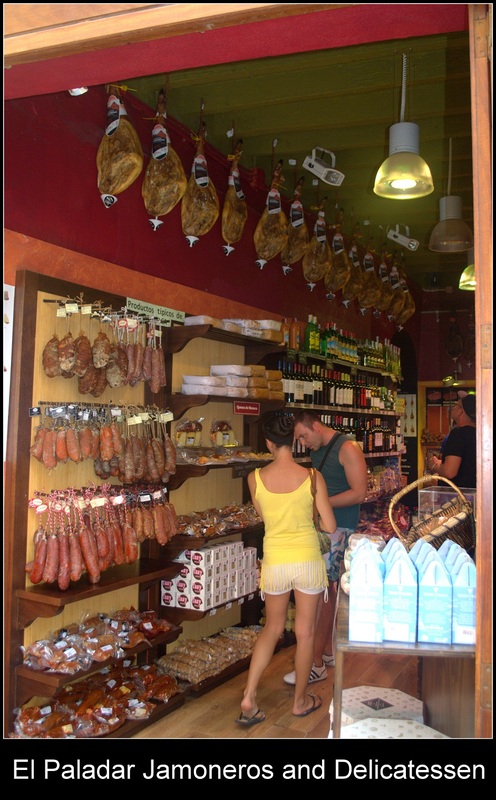 Having just returned from Menorca the routine was same almost every day: popped into Mercadona (local supermarket) and bought fresh seafood, vegetables, and the beef… oh the beef! And so cheap! After stocking up on food, ice and either Sangria or the absolutely delightful local speciality the Gin Xoriguer with lemonade or pomelo juice, back to the campsite and enjoyed a BBQ in the evenings. Needed nothing more! We tried a few restaurants at the beginning of the trip – but every single time I was left disappointed, especially if I thought of what an amazing food we could create with those ingredients at the campsite – probably for quarter of the price. 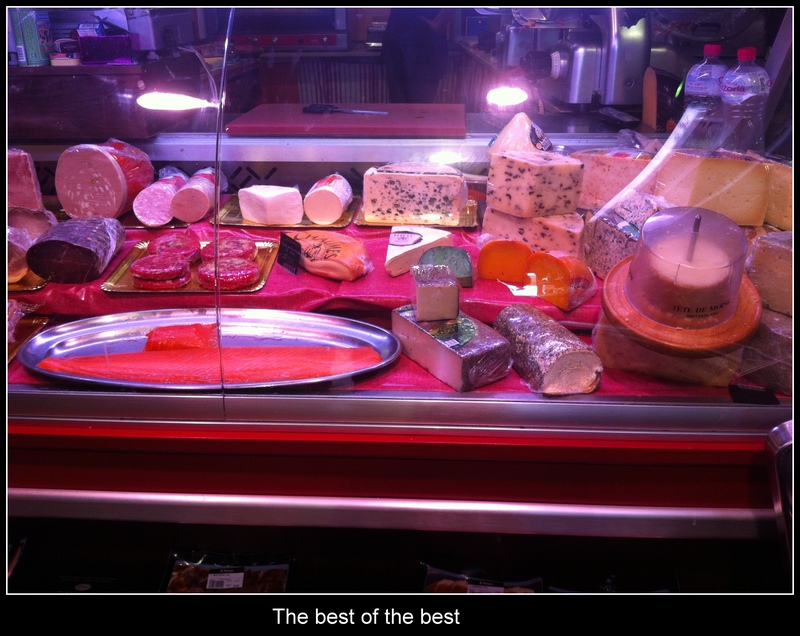 ONE place that stood out for me – I have all the details because I had to mention it in this post – was the cheapest place you can imagine, just like in France a buffet with plastic chairs… But the food was very very nice. Details in a bit. Big confession: we didn’t have paella once. I just don’t get the fascination. Or gazpacho. 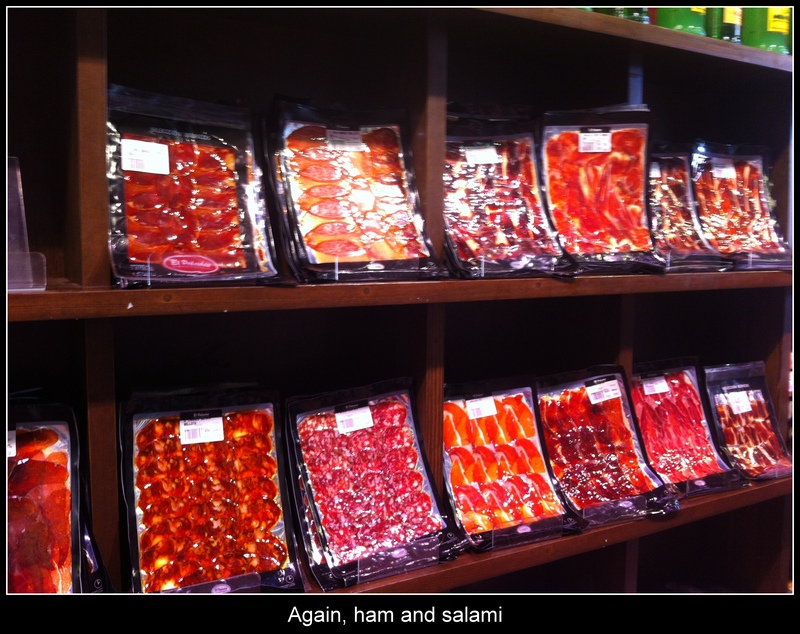 We did have Serrano jamón (dry cured ham) though, which was much saltier than I remembered. The cheese on the other hand! 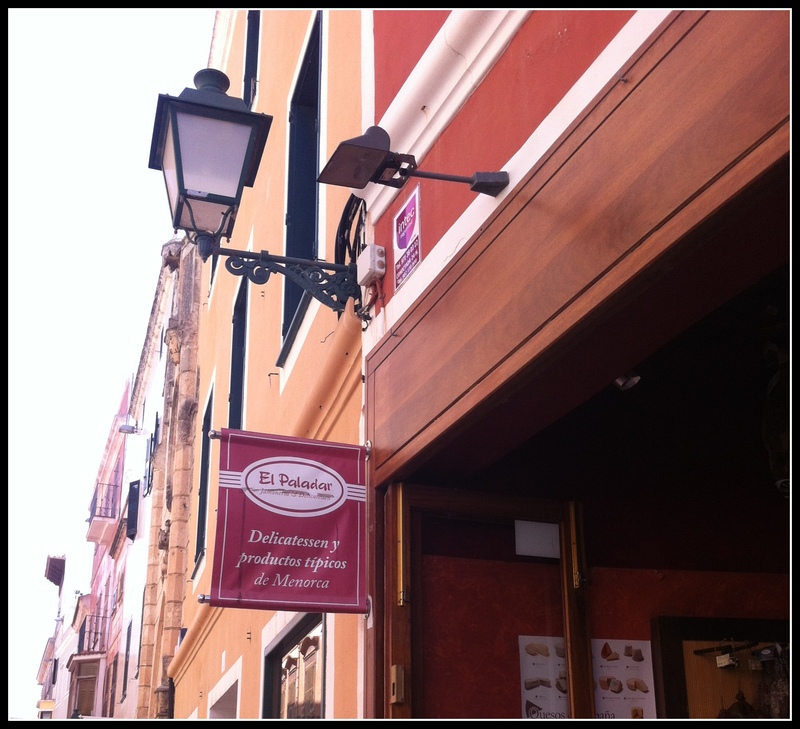 In Ciutadella there was this shop… I wanted to buy everything. Everything. Spent there at least 2 hours and Greg had to force me out. 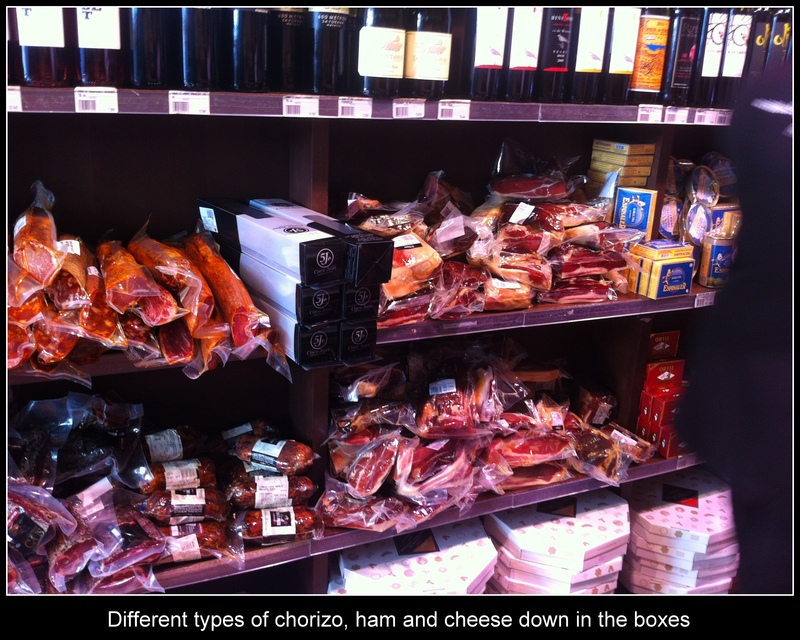 It was called El Paladar Jamoneros and Delicatessen. 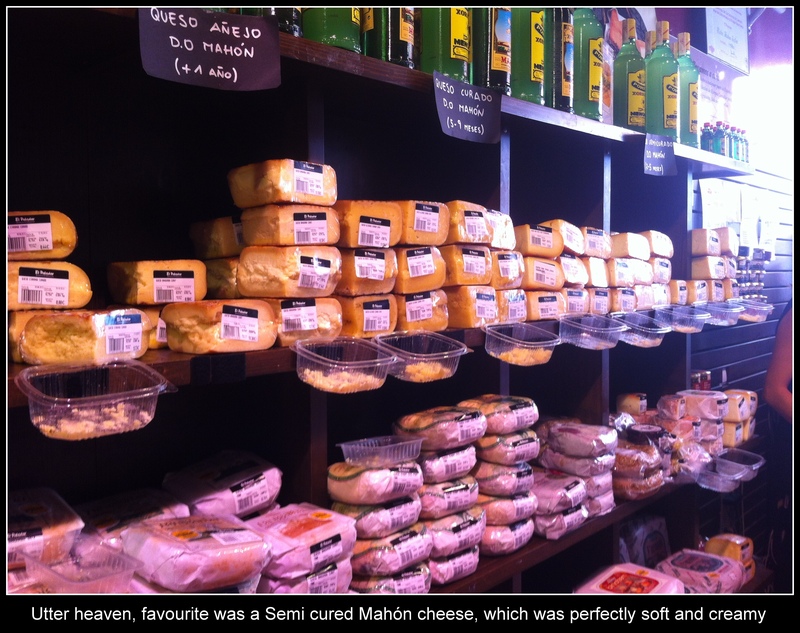 But it was so much more than just ham and cheese… They also had olives, sundried tomatoes, seafood, different types of sauces and pastes, Chartreuse and the list go on. A few examples of the restaurants we’be been to, one disappointing experience and one awesome. Let just get the bad one over with. And it wasn’t all bad, service and the place itself was excellent. The food… Remember, I am not stating they were bad dishes – but they weren’t great. Just alright. And there was one big disappointment that I took personally. The restaurant in Ciutadella was called Roma, straight in the heart of the town. Lovely setting, amazing ambiance, Greg fell in love with it straight away, but there was a queue in front of it so decided to book a table for the next night. 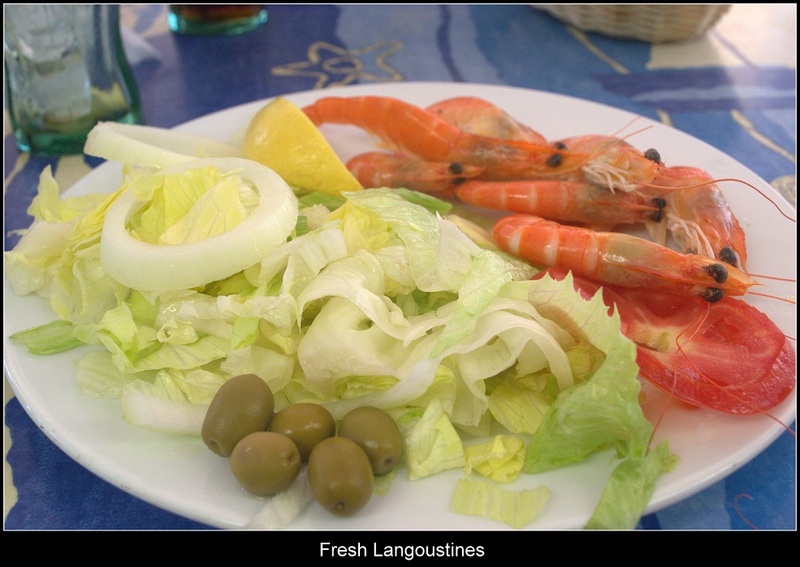 Prices were quite reasonable – €7-9 for main dish, €13+ for seafood, BUT starters were quite pricey at €6-7. 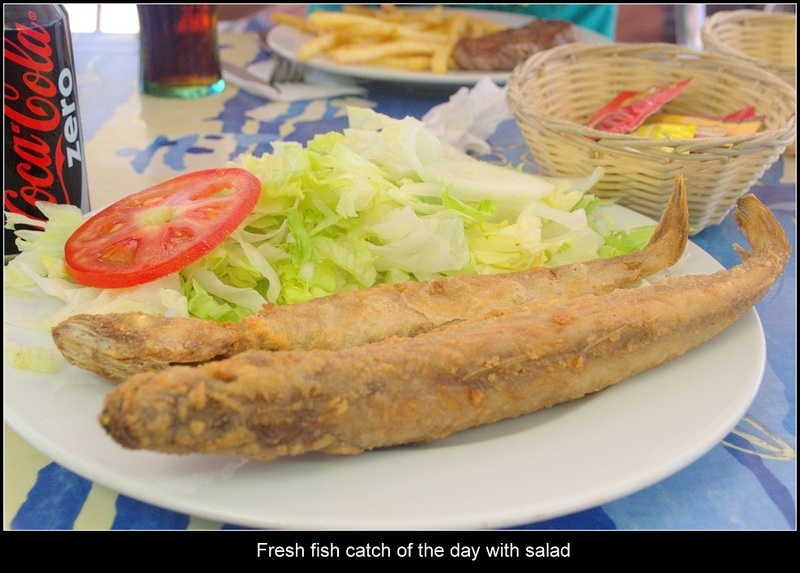 We had such a kind waitress, we told her we want traditional Spanish meals so she ordered us starters and meals that weren’t even on the menu, she just checked what they brought in today from fishing. Oh and she didn’t charge for side dish. How incredibly nice can you be? Ended up paying €25 with 2 beers. So when you visit restaurant, instead of just choosing from the menu, try to engage in a conversation with the waiter/ress to give them a general idea what you’d prefer and if they are nice enough they will tell you other options as well. But of course we were extra lucky with her. 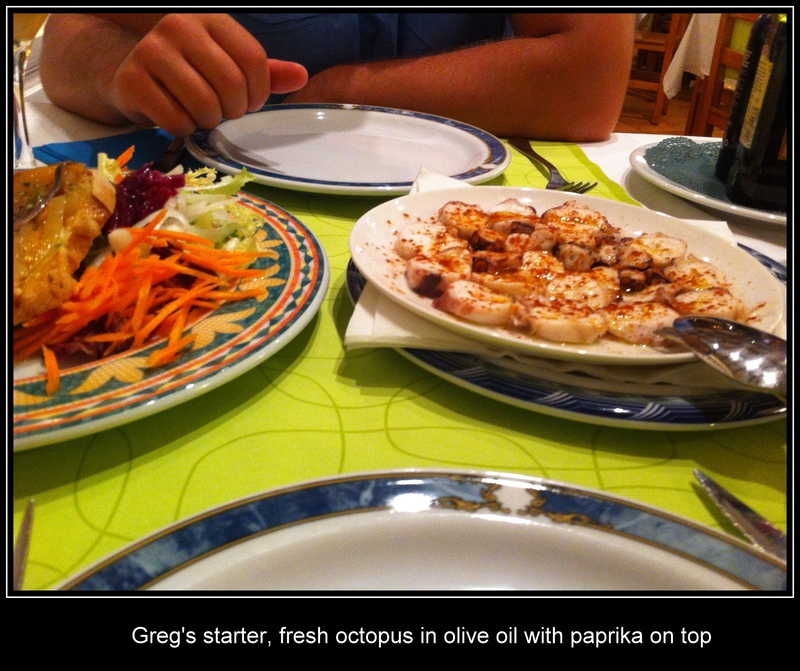 Octopus was nice. Lovely, tasty, but olive oil and paprika? Just didn’t make sense to me. 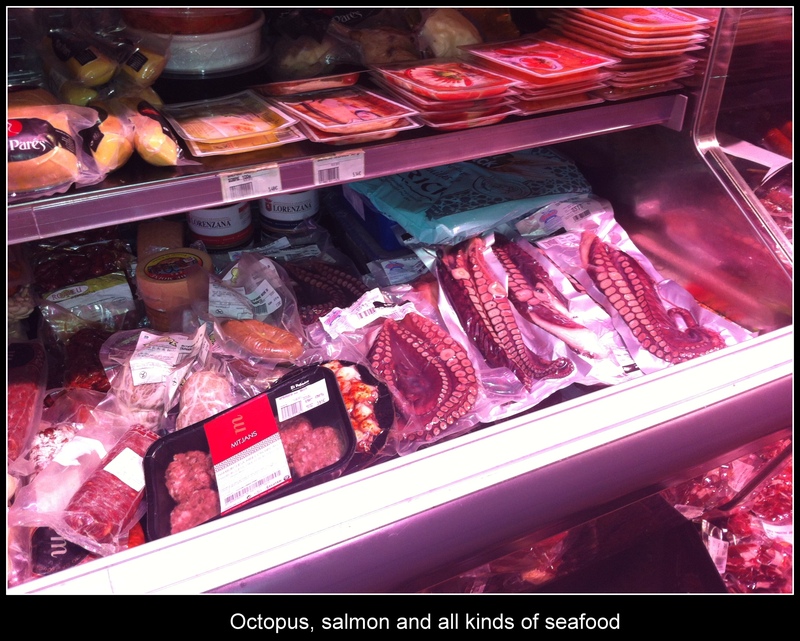 So again – quality ingredients but the method is average. I chose this one myself and the waitress immediately said that is an excellent choice as it is very traditional Spanish so I became well excited. Hmmm… First of all no seasoning. 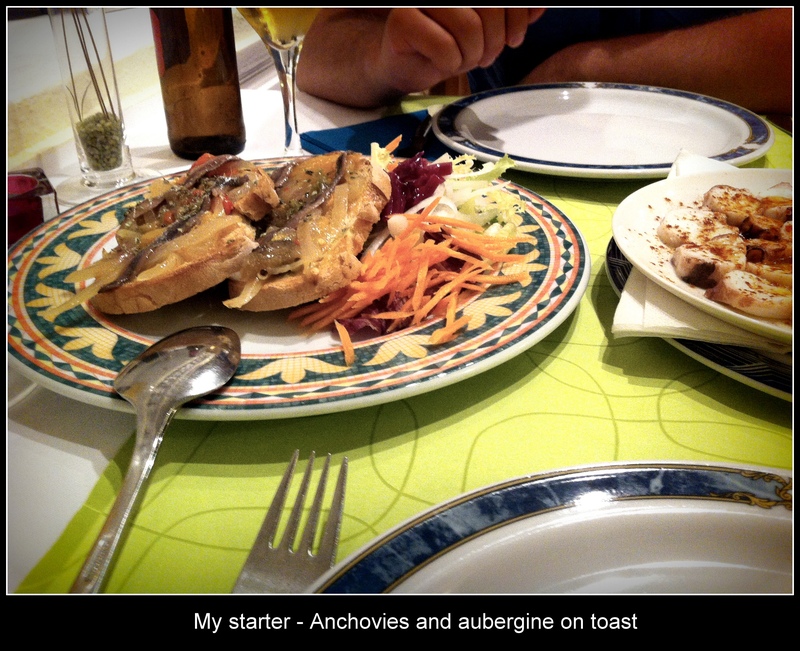 It was an ok toast with veggies and 2 anchovies on top, but the idea itself wasn’t anything unique. At least the fish was nice. There was some parsley on top and came with some potatoes which in my opinion were roasted in butter and was the highlight of the dish. And this was my big big disappointment. 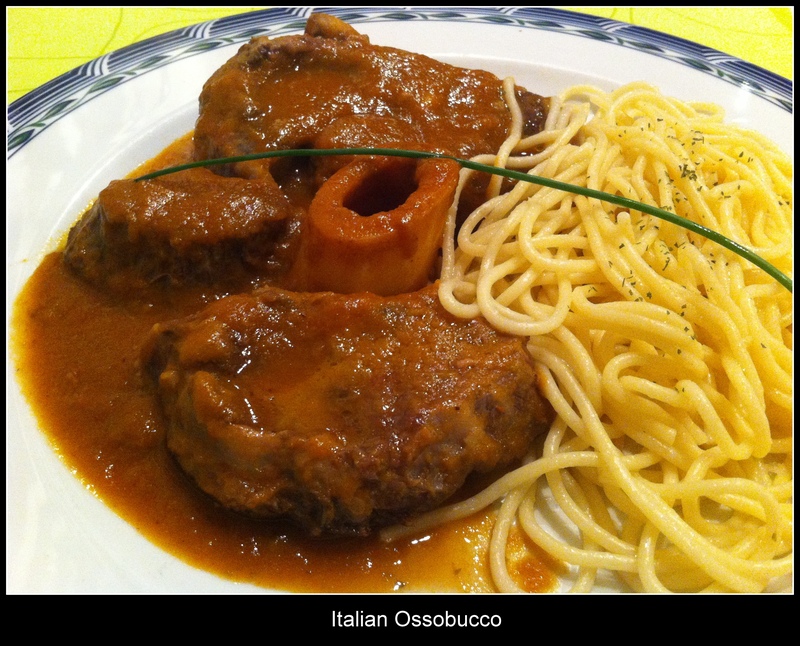 I chose this from the menu, I know it is not Spanish, but I have never eaten Ossobuco in a restaurant before, I knew I had to try it straight away. 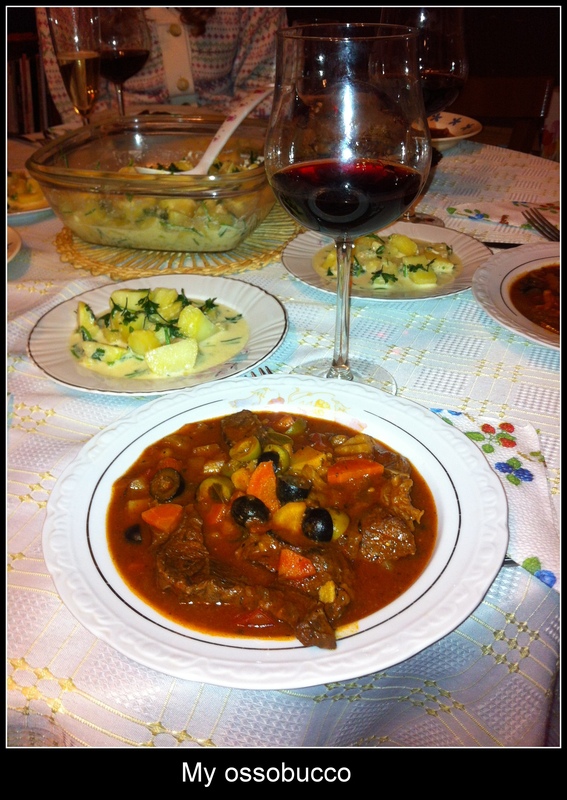 It is SUCH an expensive dish, in case someone doesn’t know what it is – it’s veal or beef shank in a rich white wine or/and tomato sauce. I have recreated this dish 2 years ago on my birthday for my whole family – I spent a good 4,5 hours in the kitchen and it was just simply heavenly. I added olives as well, but that was the only difference in the recipe. I got excited to see what is the original like, because I had no idea if I was doing it right at home… Well I was left disappointed. I am not sure if I tried it in Milan where it originally comes from it would be better, different, more special, living up to the hype around it. But this ossobucco was not even close to what I created at home. After all the negativity (sorry) some praise! The most simple little buffet in Maó (Mahón) city centre, a menu was €8 (!!) including starter, main and dessert. Wow! Did not have high expectations, but we were hungry and this kind of budget was more for us. My starter, prawns, amazing amazing amazing. That is what I am talking about. No seasoning, just the lemon… And it was perfect that way. 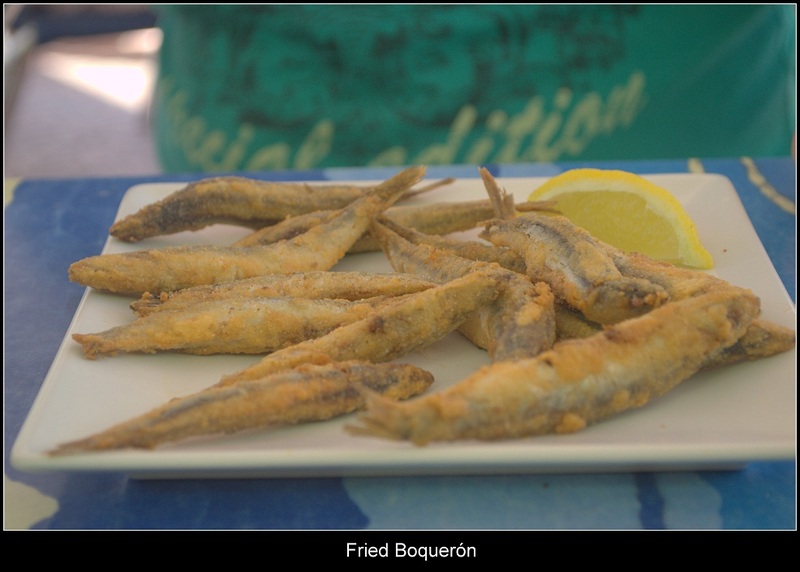 Greg’s starter was the next brilliant dish: Fried white anchovies (Boquerón). I almost told them to cancel my main dish and dessert and I will just have 2 more plates of the prawns and these anchovies… But of course I was too curious what came next. 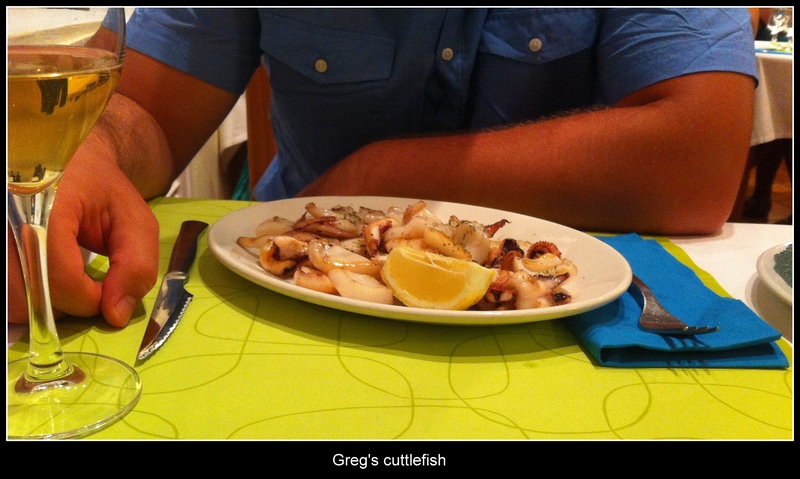 My main dish was also great, I didn’t make a note of what kind of fish was it but didn’t really matter. It wasn’t a stand out but still really good. 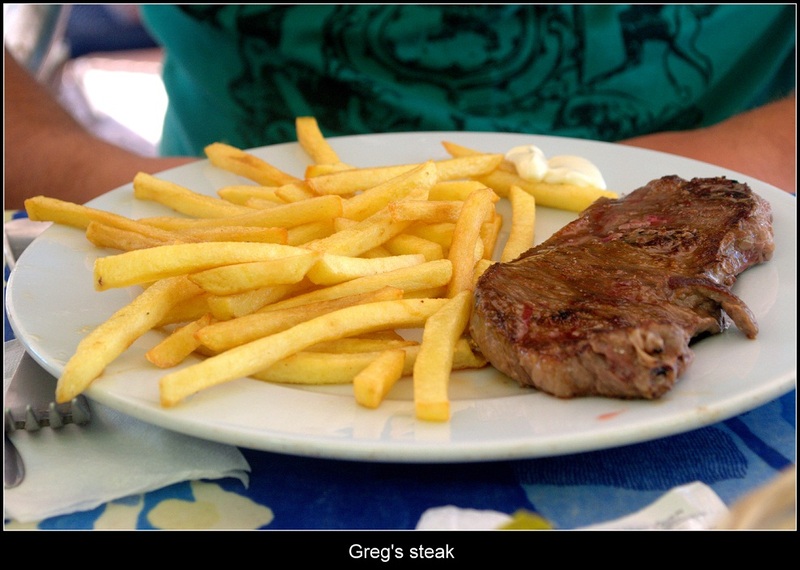 Greg’s main was a steak with chips. It was so cheap I was expecting Wetherspoon quality. Well, it wasn’t. It was a tiny steak, but that proved, no one care how you prepare the meat and how you cook it… it the beef is good quality, the animal ate proper food and was in natural environment, if it is young – the steak will be delicious. No matter what. 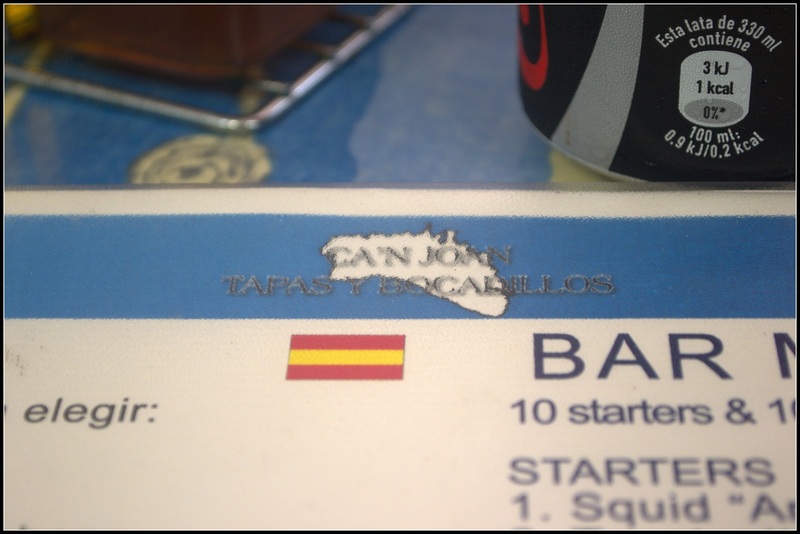 This thought was confirmed later, when we bought two huge steaks in Mercadona for €5. And Greg worried, we’d need to marinate it before, how long should we have it on the grill etc. I told him, put it on, let’s go for a walk. After 20 mins, turn it around, have a few sangrias… And it’s done. And it was. Without any seasoning, any olive oil, nothing. And it wasn’t chewy, it was pink in the middle, it was tender, tasty, juicy, just utter perfection. 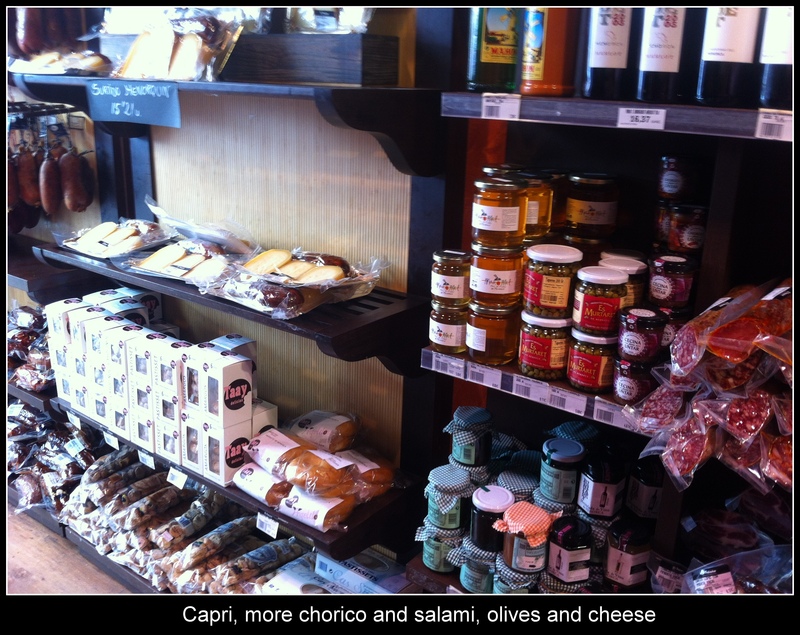 If you are on a budget – but even if you aren’t – I don’t think you could wish for a nicer lunch. Here is the menu and the name of the place… Of course it is not a sponsored post, I am not getting paid to praise the place. Please please anyone, if you know any Spanish recipes, that has the WOW factor let me know! In the next post I’ll introduce the dishes we created (such simplicity with such flavours!) and one restaurant warning. Adiós!